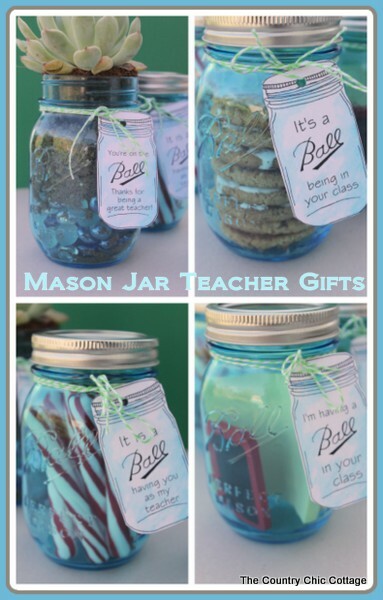 You are here: Home » budget friendly » Teacher Appreciation Gift Ideas in a Mason Jar plus MORE! 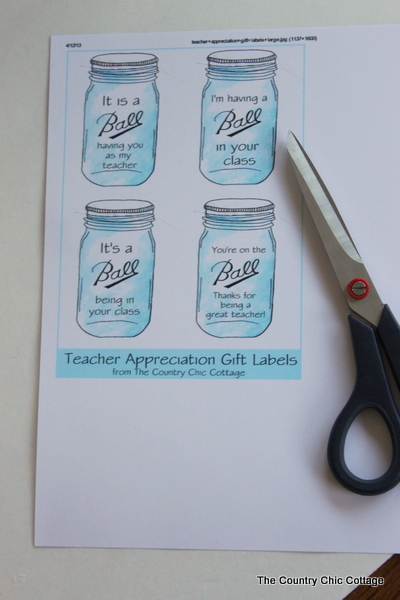 Teacher Appreciation Gift Ideas in a Mason Jar plus MORE! The mason jars used for this post were given to me by Ball and are part of their heritage collection. Y’all are going to love that vintage blue hue! 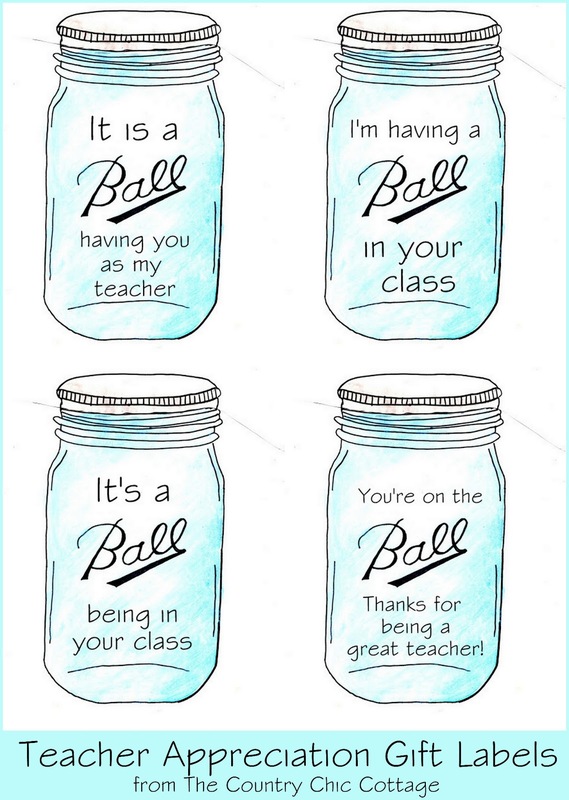 Want to give your teacher a great gift to show your appreciation? Maybe you can’t afford a large gift but want to make your small gift special. I have some printable mason jar tags for you that will make any small gift great. Plus some friends of mine have joined in with me to bring you even more ideas for Teacher Appreciation Day. Be sure to click over to their blogs at the bottom of this post. Just add your gifts to your jars and print the labels below. Click on the image and print on card stock. Then cut out your labels. Each page has four different sayings for you to choose from. Punch a hole in the labels and tie to your jars. Your kids will love handing these great gifts out to their teachers. 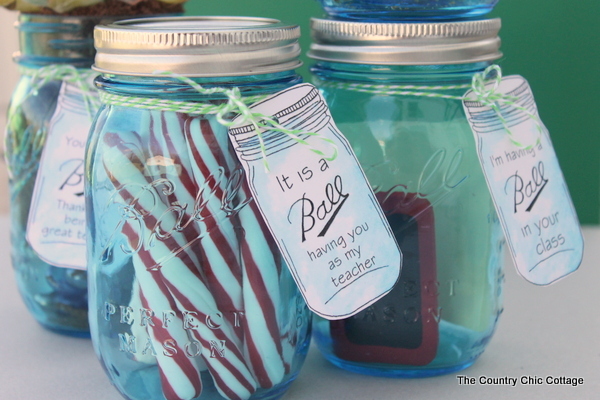 I love the blue jars with the labels and I am sure any teacher will love them as well. Where can you buy the heritage collection jars? You can try at a store near you or buy them from Amazon. 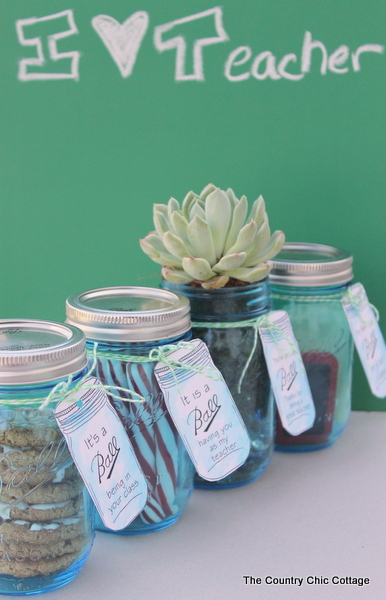 Want to see even more mason jar crafts? Check out my mason jar craft gallery page! Y’all don’t forget to visit the lovely ladies below to see even more great Teacher Appreciation Day ideas! 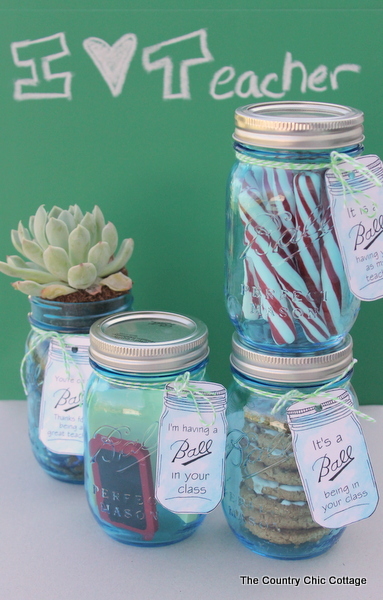 Those jar labels are adorable!! Angie, this is SO cute!! 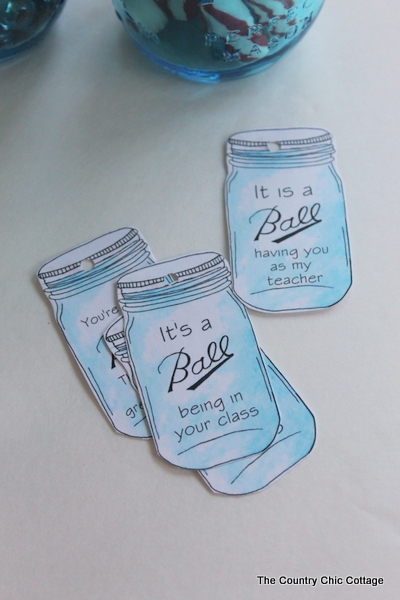 I love the “It’s a Ball to be in your class” tags…so adorable! What a wonderful thing to share with all of us, thanks so much Angie. I don’t have young kids and my grand kids are all older or I’d make things for them to give their teachers. The labels and jars are so wonderful. I can only imagine the younger readers with small children will be thrilled with the labels and ideas. I absolutely love this!!! And one of my daughter’s teacher’s name is Ms Ball. I can’t wait to do this for her! 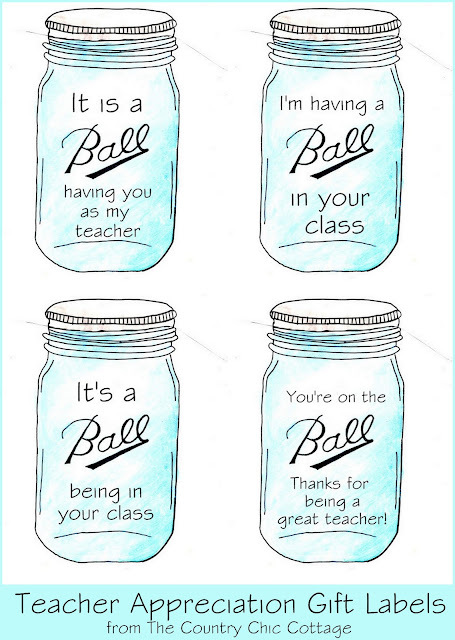 I’m going to send one to her every day of teacher appreciation week! Thanks for sharing! These are so cute! These would be great gifts for our PTO CHairperson(s). WOuld there be a way to do one that says, “Your on the Ball–Thanks for all that you do!” or something along those lines?? Just love this idea! Ok this is too cute! Oh I love these!! 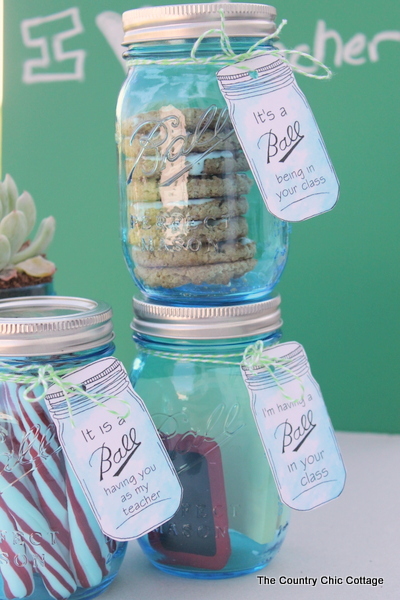 I just bought some Ball jars at Walmart and am filling them with cookies for my son’s teachers for Teacher Appreciation. I’m definitely using your adorable labels! I’ll be posting a link to them from my blog with a picture of the jars. Love, love, love these! Thank you! Thank you so much for the use of the labels. Since Ball came out with their Heritage Spring Green I’m going to make some awesome teacher appreciation gifts this year! I can’t wait to see how they turn out. Thank you, thank you for all the stuffing suggestions. Much appreciated! Thanks so much for sharing these! A pin from this post Pinterest inspired me (before even seeing your post). I posted about my result and linked one of your images – hope that was okay! Thank you so much for the use of these precious tags! We filled a ball jar with orange Tic-Tacs (our teacher’s favorite candy) and attached these tags. Precious! I absolutely adore these, Angie. I was feeling guilty because I had no teacher appreciation gift in mind, but now I can whip something up this week for my kiddo’s teachers. Now, to figure out what to fill them with! love this so much! pinning!